Waheguru Ji Ka Khalsa Waheguru Ji Ki Fateh. Hukamnama today is by Guru Ram Das Ji with a salok by Guru Amar Das Ji in Bihaagarhaa Raag on Ang 552 of Sri Guru Granth Sahib Ji. Maharaj Ji says bin which means without, sayvay means serving,satgur - the eternal Guru; without serving the eternal Guru, Satguru Paadshah Ji says all of those people, jaytay, who do not serve the Guru and serving the Guru means in all different levels, on physical level - physical sayva but internally following what the Guru says. All of the karam, all of the actions that we dokaram kamaahi - Guru Ji says all of the actions that we are doing, Maharaj Ji says, jee-a kay baDhanaa, jee means soul and banDhnaa literally means tying it down, shackles. Maharaj Ji says without serving the Guru, without following what the Guru says, without trying to walk upon the Guru's path; everything that we do will end up tying us down. Everything we do will be a shackle upon us. Everything we do will imprison us. Now what does this mean? It means those actions we do without Guru in mind they are harmful to our soul. If we are living our daily life those actions which we do without Guru in our mind, Guru Sahib ji says, they will surely tie you down. But if you follow what the Guru says then Sri Guru Amar Daas Ji will tell us later in the Hukamnama what happens to those people. Without serving sayvay the eternal Guru satgur, will not find rest, thavar means somewhere to rest. It means where you can find peace. Only through sayva, serving the true Guru with your mind, body and soul can you find true peace. There is no other peace in the world. Satgur Ji says without serving the true Guru ,mar - we diejameh - we are born again and aavahi jaahi and we are struck in this cycle of death and birth, coming and going onto this earth. aavahi jaahi literally means to come and go. Why is it we may say that without serving our Guru, that our actions tie us down; why is it we come and go. Because those actions which we do according to our si-aanap, according to our own cleverness, according to our own thinking, without the Guru in our mind, they will tie us down. Our mind is crying out loud to indulge in lust, anger, greed, ego but when we join with the Guru, when we entrust in the Guru, then the Guru saves us from these entanglements. Satguru Paadshah Ji says without serving the Guru, following what the Guru says,fikaa bolnaa all of the words we speak arefikaa - completely tasteless. So those words spoken without Guru in mind, without serving Guru, they are fikaa they are tasteless, they have no essence in them of love. And in fact the wordfikaa has a negative connotation of being actually sour in taste. without serving Guru, our words are all tasteless. This means they do not inspire love anymore. They do not inspire compassion anymore. Guru Ji goes on in explaining naam na vasai man aa-ay, vasai means to abide, man aa-ay means our mind, naam means name of God, Akaal Purakh. without serving the true Guru each one of our words are insipid, tasteless. If we ask Guru Sahib why are these words tasteless, Guru Ram Daas Ji says because the naam, name of God does notvasia, does not abide in that person's heart, in that person's mind. Those people who speak without Simran, remembrance of God their words are tasteless. But those people who have remembrance of God running though them each one of their words is beautiful. Each one of their words is embellished by God himself. Satgur Ram Daas Jii says without serving the eternal Guru jam pur baDhay maaree-ah you will be bound down,baDhay and if we remember what Guru Sahib Ji said in the first tuk it will be our own deeds which will tie us down.jam pur in the city of death, maaree-ah we will be beaten to death due to our own actions, muhi kaalai with faces blackened, uth jaahi they will leave this world. Satgur Paadshah Ji is saying muhi kaalai - dishonored. Honor is not bought through money, honor is not bought through status, those are honorable beings who meditate upon Waheguru and those who haven't Guru Sahib Ji is explaining what happens when we do not connect to Akaal Purakh, Waheguru. Guru Amar Daas Ji Maharaj now says, is telling us the fruit of sayva. But there are those who serve the Guru as chaakree, chaakree means to be a slave, a servant. They serve the Guru as slaves. They don't serve the Guru maybe once or twice, they devote their lives, just like a slave is devoted. Same way karahi chaakree they serve their Guru as slaves, as servants. har naamay lagai pi-aar and through their service their pi-aar their love inside them lagai - they are attached to love for Naam of Hari, the name of God, the name of Waheguru. Waheguru himself is the school. Now in this pa-orhee we will realize that Guru Ram Daas Ji Maharaj is giving us an insight to that of being where Bai Kanhai-aa Ji was. 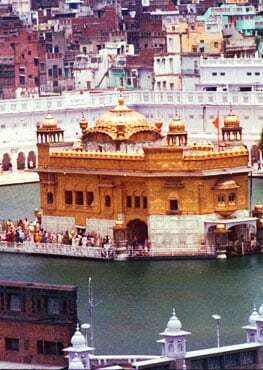 Where he could see Waheguru Ji permeating through all. That is what Guru Ram Daas Ji Maharaj showing us , giving us the insight, a window into this pa-orhee. aapay chaatsaal Waheguru himself is the school. aap hai paaDhaa Waheguru himself is the teacher, Waheguru himself is the chaatrhay - the students, parhan ka-o aanay Waheguru himself brings them to parhan - to study. aapay pitaa Waheguru himself is the father, maataa hai aapay Waheguru himself is in the mother, aapay baalak Waheguru himself is sitting in the children and karay si-aanay makes them older. Sitting in one place, sitting inside one body Waheguru is the one parh bujhai who gets them to study and understand. sabh aapay ik thai aapay karay i-aanay And in one place he himself is the one who is making them i-aanay meaning childlike and can be interpreted as ignorant. So in one he is childlike and on the other hand he is sitting and giving this understanding. O Waheguru, O sachay true Lord, those whobhaanay - who please your man - your mind; those who have pleased you, to those people what do you do, iknaa andar mahal bulaa-ay you bulaa-ay you call them into your mahal. andar means into andmahal means mansion. What does this mean that you call them into your mansion? But Waheguru Ji unites them, unites that little soul,aatma into paramaatma, unites them into himself. In this last tuk Satgur Ji says those who by following the Guru you are blessed with the greatness of the Guru. Those who do thesayva those who serve the Guru are blessed with greatness andsay jan those humble beings sachee dargahi jaanay they are honored, they are respected in the true court in your presence. So Guru Piaa-rio Satgur Maharaj is telling us if we live our lives without sayvaa, without serving the Guru everything we do will be tying us down, everything we do will lead us to anger, greed, to anxieties. But if we start following the Guru Satgur Paadshah Ji is saying not only you will be saved but all those around you will be filled with effects by following the Guru.